The new Uniden Bearcat EZI 33XLT is a handheld scanner in a compact design and covers low VHF, FM, Airband, VHF and UHF bands. This scanner has replaced our Uniden UBC30XLT model. The small size of the Uniden Bearcat EZI 33XLT makes it easy for the user to take it out in the field by attaching it to the belt or carrying it in a pocket. The scanner is made from robust materials. 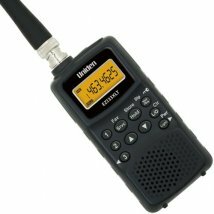 Box includes: EZI 33XLT Scanner, Antenna, Beltclip, 3 x AA Batteries, Earphone and Instructions manual.